So earlier today on Twitter, Denis Farr and I were discussing how mages in the Dragon Age universe have a lot of queer readings, especially in the sense of political queerness in the 70s/80s. In the process I mentioned that I got a similar vibe from the much-maligned cast of Final Fantasy 13, specifically the relationship between “fal’Cie” (power supernatural beings in the setting) and “l’Cie” (e.g. the heroes of the game). In keeping with a drive to shorter stuff more often, I figured I’d delve into that tonight. the l’Cie (pronounced ‘luh-see’). A l’Cie is a mortal — usually a human, the only real mortal sentient race in the FF13 world — who has been “branded” by a fal’Cie. This branding results in a few specific effects. First, a l’Cie gets an actual, physical brand somewhere on their body. Second, l’Cie are given a special task called a “Focus.” This Focus is never stated outright, with the l’Cie’s only clue being an abstract vision they see at the moment of branding. If a l’Cie completes their focus, they’re put into “crystal sleep” (they literally turn to crystal) until they are needed again and receive a new focus. If they don’t, they become “Cieth,” a fancy word for zombie: Cieth are mindless, predatory undead with only the vaguest hint of their former lives driving them to haunt locations, etc. The final thing a l’Cie receives is power: they develop a crystal fragment in their bodies that gives them supernatural abilities, like magic, superhuman toughness, etc. It is this power that allows a l’Cie to carry out the will of the fal’Cie that brand them. Important note: the main characters of FF13 are all l’Cie. “We take l’Cie so that we might wield such strength.” It’s an interesting idea: in the game’s lore, Bhunivelze kills his mother to take control of the Mortal World, one half of the universe. His mother falls into the Unseen World, the other half, the land of the dead, but Bhunivelze comes to believe that his mother has cursed the Mortal World to disappear someday and thus desperately seeks her out, but he can’t enter the Unseen World without giving up dominion of the mortal realm. So, he creates three powerful fal’Cie: Pulse, Lindzei, and Etro, and tasks them with finding the gate to the Unseen World. It’s Etro — who Bhunivelze unintentionally creates in his mother’s image, and thus comes to hate — who actually makes it, because she kills herself in despair over her father’s abandonment of her. In the mythos, humans were born from Etro’s blood, spilled in her suicide. In the Unseen World, Etro discovers the dead mother, who is being swallowed up by a force called Chaos (capital-c “Chaos”), a force that — left unchecked — will tear both worlds apart. Tasked with keeping the balance, Etro saw humans and implanted a tiny fragment of Chaos into everyone, which became their “soul.” On death, a person’s Chaos fragment (their soul) passes through the gate to the Unseen World and returns to Etro, who then passes it back to be reborn in the Mortal World. Thus the balance was maintained. This plot point is deeply buried in FF13, barely explained, yet is massively important to the game’s mythos… reinforcing my belief that the series’s most egregious failure is having a rich mythology that is largely hidden from the player and poorly incorporated into gameplay itself. Regardless, it’s interesting to me that makes humans “human” in the FF13 world is this fragment of Chaos: the ability to move beyond your programming, to step outside of expectation, and to defy destiny. The superpower humans possess is “unpredictability.” The fal’Cie, by contrast, emphasize over and over again that they’re given a purpose which defines every aspect of their lives. Even the seemingly meandering machinations of Barthandelus that make up FF13‘s plot engine are primarily there to serve his stated purpose: to serve Lindzei and return him to the world (which he plans to do by forcing Etro’s Gate open through killing millions of humans all in one go). As you might expect, becoming a l’Cie seems like a death sentence. Your options are to become a mindless, hungering zombie (if you fail) or to be used as an immortal, agency-less tool by a higher fal’Cie power at their whim for eternity. Neither option is particularly pleasant. The game presents this dilemma very early in the game and, when I heard it, it struck an early chord with me re: queer identity. The l’Cie never asked for — never wanted — this thing they were given, which comes with no instruction, promises only your destruction or slavery as end results, and which literally marks you forever with the brand of your oppressor. Being l’Cie means having tremendous power that you might not otherwise be able to obtain, but in the process you become the world’s enemy. There’s a lot to unpack here, and it requires some more of the game’s mythology (sorry). Barthandelus and Orphan are fal’Cie from Cocoon, a human city inside a moon-like structure that floats above the planet. Their plan to bring back their maker by killing tons of humans involves destroying Cocoon (and everyone who lives there)… but because they’re Cocoon fal’Cie, they’re forbidden to harm the people of Cocoon, as protecting them is part of their purpose/Focus. Their loophole is to get the fal’Cie of the planet Pulse, which Cocoon orbits, to brand l’Cie and task them with destroying Cocoon in their place — this is exactly what happens at the start of the game. Fang and Vanille are not from Cocoon, unlike the other major characters; they’re from Pulse, and were branded as l’Cie on Pulse 500 years ago, during a great war which grew out of the last time someone tried this mass murder trick. To destroy Cocoon, Fang and Vanille were intended to become a giant, superpowered destructive beast: “Ragnarok.” However, Vanille — who isn’t particularly aggressive by nature — didn’t transform, leaving Fang to do it on her own, and she’s thus incapable of succeeding. Etro stepped in and put both Fang and Vanille in premature crystal stasis, ending the war… but 500 years later, in the time of FF13, their crystal forms were transported to Cocoon and they were awakened to complete their Focus, an event that is a major catalyst for the events that set FF13‘s plot in motion from the POV of the main characters. In the scene I just linked, Fang agrees to become Ragnarok and destroy Orphan, having lost her hope, but she’s incapable (again) of doing it alone as without Vanille, her Ragnarok form isn’t complete. Orphan thus tortures Fang to compel Vanille to transform as well, which is what’s happening when the linked portion of the scene is playing. When the main characters return — miraculously and against all logic — from having apparently been turned into Cieth, they describe saving themselves as effectively rewriting their Focus. They changed the rules of the game, rejected the mandate of the fal’Cie, and were able to return to life with all of the power of their investiture — the abilities that becoming an Other gave them — but none of the death sentence. As Sazh says, “I dunno. It was like a new Focus or something.” Later in the scene, Lightning, in telling Orphan that they’ve moved beyond the fal’Cie, says “When we think there’s no hope left, we keep looking until we find some. We live to make the impossible, possible. That is our Focus!” Even their Brands — the visible, physical manifestations of their servitude — are now burned out, bleached white, unrecognizable. I find that particular scene, and its message, really fascinating and personally kind of great. 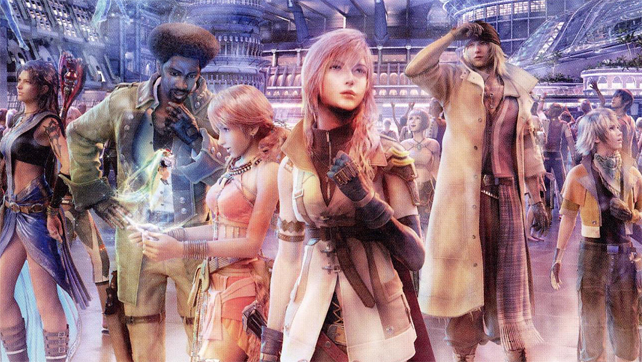 The heroes of FF13 spend a lot of the game not working as a team. Hope blames Snow for his mother’s death; Vanille blames herself for Sazh’s son being made a l’Cie; Fang blames herself for Vanille’s pain; Lightning blames Snow for her sister Serah’s fate. Everyone in that group of six characters has plenty of reasons to hate and distrust the other members and for the first third of the game or so, they do hate and distrust each other. Lightning inadvertently fuels Hope’s desire for revenge and Vanille begs Sazh to kill her on the spot when the truth about his son’s Brand comes out. Even their backgrounds put them at odds: military Lightning dislikes rowdy, anti-establishment Snow, while Hope’s upper class sheltered life doesn’t prepare him for what’s about to happen. Vanille and Fang are the last two people alive from a civilization that died out five centuries ago; their return to their hometown of Oerba toward the end of the game, which is now a sand-drenched wasteland, is heartbreaking. Sazh, a single parent, loses his son to the government when said son is branded a l’Cie. Everyone has their distinct, personal reasons. But they need each other to survive. They find a way to make that happen. Despite their backgrounds, their motivations, their reasons, being branded l’Cie — being cursed with a fate worse than death, driven by their Focus to kill not just their friends and family but millions of strangers — means that they must rely on each other or die in the process. And in the end it is their bond, their shared moments, that drive them to create this new Focus that lets them move beyond the structures that created their dilemma in the first place. I don’t think this metaphor is perfect. I think it has a lot of possible flaws, and alternative readings. But the idea that people with differing backgrounds, and no reason to love each other, can bond over their shared exile from society, their shared inability to grasp the enormity of what’s been set before them, and their shared need to master the power to create their own destiny… I think that has tremendous queer resonance. That the fal’Cie who set them on the path represent an actual in-game government of a functionally closed society they are grooming for their own ends only sweetens that deal, to me… especially since they are doing so out of a realization of their own limitations. “We make l’Cie of men so that we might borrow that power.” The straight hegemony asks queer peoples constantly to define themselves in relation to the straight world. In the process — by assimilating and subsuming our queer selves — we can indeed acquire “power.” But it’s power on the hegemony’s terms, power for their ends, not ours. Only by mastering our own power, creating our own “Focus,” can we move on and realize ourselves and our potential. But doing so doesn’t have to have antisocial ends. In fact, mastering our power and using it for our own ends might — as Fang and Vanille’s ultimate act of love proves — save the world after all. Say what you want about FF13 the game… but I think that’s amazing. Really awesome article (and website, which I’ve only just discovered!). I’m a huge fan of the mythopoeia of the FF13 series; but, like you, I often despair that it isn’t made more explicit in the actual games. (In truth, the vast majority of my FF13 plot knowledge comes from reading summaries/cribs online, rather than from what I could grasp from the games themselves). The series definitely suffers from a kinda amazing-story-badly-told syndrome. I wonder how much influence the ‘Eternal Champion’ series of novels by Michael Moorcock had on the FFXIII universe? The books are about an never-ending, multi-dimensional struggle to maintain “balance” in the face of “Chaos”; and – reading your article – I’m struck by how similar much of the terminology used in FFXIII is to Moorcock’s books. Probs just a coincidence, but interesting all the same. ( http://en.wikipedia.org/wiki/Eternal_Champion ). I can’t comment specifically on your gender/queer-theory reading of the game, because I’m definitely not well-read enough in those areas to do so with any insight, I’m afraid; but your interpretation is fascinating, and seems right on the money, to me. It also chimes nicely with my own far-left reading of the game’s representation of hegemony and the fal’Cies’ control of the L’cie as a sort-of marxist analogy for the division of labour and control thereof. Like Tom, I think this is a really interesting reading of the series – I don’t play FF games (because I don’t own a PS-anything), so I have no personal investment in them, but this does make me want to read more about the relationship between your queer analysis and the religious implications of monotheism. Specifically, I guess I’m curious about how a reading of the l’Cie as agents of queerness within a monotheistic framework that must have some resonance against Judeo-Christianity, whether positive or negative.